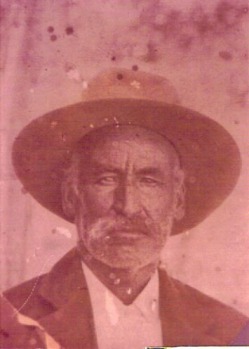 Julian Jimenez Garcia was born January 16, 1865 in Ojinaga, Chihuahua, Mexico. He immigrated to the United States with his family around 1873. On November 30, 1883 he married Isabel Chavez in Fort Stockton, Texas. The daughter of Fermin Chavez and Pilar Ornales, she was born in Delicias, Chihuahua, Mexico in 1864 and was baptized in Santa Cruz de Rosales, Chihuahua, Mexico on July 3, 1864. Isabel immigrated to the United States with her family circa 1873. Soon after their marriage, Julian and Isabel settled in Fort Davis, Texas, where their first seven children were born. They lived in Marathon between about 1899 and 1901, where two more children were born. While in Marathon, Julian worked as a freighter. In 1901 they moved to Terlingua, where the last two children were born. In their early years in Terlingua, Julian and his brother Dolores worked as freighters and hauled mail between Terlingua and Alpine. Julian’s three oldest sons, Monico, Marcos and Dario drove the mail coach. By 1916 Julian probably was working for the Chisos Mining Company, but not in the mines. In 1927 he was working as a salaried employee of the company, earning $54.25 per month. In July 1927 his salary was charged to the Water Account, suggesting that his job was delivering water to the residents of Terlingua. 1. Daughter Simona Garcia was born in Fort Davis October 28, 1884. She died in Terlingua in 1907 and is buried in El Camposanto del Arroyo (also known as the 248 Cemetery) near Terlingua. At the time of her death she was engaged to be married to Anastacio Valenzuela. 2. Daughter Rosenda Garcia was born in Fort Davis January 1, 1886. She died in Fort Davis in 1894. 3. Son Monico Garcia was born May 4, 1888 in Fort Davis. In 1910 he and brothers Marcos and Dario were driving the mail wagon between Terlingua and Alpine. In 1916 he hauled 18,228 pounds of freight for the Study Butte Mining Co., earning $91.14, and in 1920 he was working as a mine laborer. In the early 1920’s Monico and Luz moved to New Mexico, eventually settling in Loving. Luz died September 16, 1972 and Monico died January 15, 1980. Both are buried in Loving, New Mexico. A. Son Primitivo Garcia was born November 27, 1910 in Terlingua. He helped his father run the Garcia Grocery in Loving, New Mexico. He died July 7, 2006 in Loving. B. Son Facundo Garcia was born in Terlingua June 12, 1913. He died in Loving, New Mexico September 3, 1977. C. Daughter Amelia Garcia was born September 16, 1916 in Terlingua. She was baptized in Chisos April 10, 1917 by Father Antonio Alonso. Her godparents were Adolfo Chavez and Rebeca Luna. She married Ramon Lerma and they had seven children. a. Daughter Sylvia Castillo had two husbands, Armando Hinojos and Philip V. Trujillo. b. Daughter Mitzi Della Castillo was born in 1955. She married Carlos Santana. c. Son Joe X. Castillo, Jr.
d. Son Tim Castillo was born in 1959. He married Sandra Villa. e. Son Paul Leslie Castillo was born in 1961. He married Anna Jo Muniz, born in 1964.
f. Son Jeffrey Castillo was born in 1965. He married Esther Parringa, born in 1966.
a. Son Alberto Palomino was born in 1958. His wife’s name is Nancy. b. Daughter Brenda Palomino married Rusty Granado, born in 1959. (3). Son Julian Lerma was born in 1943 and died in 1980. His wife’s name is Colleen. (4). Son Joe Lerma was born in 1945. He had two wives, Edwina Pantoja and Susan Sullivan. a. Daughter Rita Holguin was born in 1965. She married James Brown, born in 1962. (6). Son Frank Lerma was born in 1947. He married Viola Mendez. a. Son Julian Diego Dominguez was born in 1989. D. Son Leandro Garcia was born February 27, 1919 in Terlingua. He died in Loving, New Mexico, February 27, 1995. (1). Son Gilberto Onsurez was born in 1946 and died March 9, 2005. He married Emma Rodriguez. (2). Son Ricardo Onsurez was born in 1948. He married Mary Molina. (3). Son Arcenio Onsurez was born in 1950. His wife Josie was born in 1951. (4). Son Daniel Onsurez was born in 1951. His wife’s name is Gussie. (5). Daughter Carol Onsurez married Tony Duarte. (1). Son Edward Garcia was born October 15, 1948 and died September 9, 1999. (2). Daughter Raquel Garcia was born April 17, 1961 and died October 30, 1961. (3). Son Fred Garcia. His wife’s name is Brenda. (4). Daughter Rachel Garcia married Robert Lopez. (1). Son Julian Garcia married Dora Martinez. (3). Daughter Andrea Garcia, born in 1955, married Adan Valenzuela. (4). Son Miguel Garcia was born in 1956. (5). Son Gabriel Garcia was born in 1958. He married Estela Holguin. (6). Son Asencion Pablo Garcia was born in 1962. (7). Son Robert Steven Garcia was born in 1968. (2). Son Luis Garcia, Jr. His wife’s name is Belia. (5). Daughter Angelina Garcia. Her married name is Martinez. (6). Son Felipe Garcia married Martha Franco. (7). Son Ben Q. Garcia. His wife’s name is Gloria. (8). Randy Q. Garcia. His wife’s name is Sara. I. Son Alberto Garcia was born March 20, 1931. He died in El Paso, Texas of Meningitis on March 18, 1944 and was buried in Carlsbad, New Mexico. He was a resident of Loving at the time of his death and apparently had been taken to El Paso for medical treatment. (1). Daughter Rita Garcia was born in 1959. She married Martin Dorado. (2). Daughter Rose Garcia was born in 1960. She married Jim Mitchell, born in 1955. (3). Son Ernie Garcia had two wives, Viola Esquibel and Vicky (family name not available). (4). Daughter Margaret Garcia was born in 1962. She married Raul Hernandez, born in 1961. (6). Son George Garcia was born in 1964. (7). Daughter Grace Garcia married Joel Onsurez. He was born in 1961. (8). Daughter Kimberly Garcia was born in 1970. She married Steve Green. 4. Son Marcos Chavez Garcia was born June 18, 1890 in Fort Davis, Texas. He moved with his parents to Marathon, then Terlingua, where he and brothers Monico and Dario drove the mail coach between Terlingua and Alpine. By 1920 he had returned to Marathon, where he was working as a laborer on the railroad. In 1930, still living in Marathon, he was working as a section hand on the railroad. He continued to live in Marathon until his death. He died in Brewster Memorial Hospital in Alpine November 11, 1969 of hypostatic pneumonia and is buried in Holy Angels Cemetery, Alpine. A. Son Magdaleno Garcia was born July 22, 1917 in Marathon and died In Odessa March 13, 2007. He is buried in Alpine. He married Maria Acosta, daughter of Jose Acosta and Clara de la O. She was born December 9, 1926 in Santa Elena, Chihuahua, Mexico and died in Marathon February 28, 1999. She is buried in the Marathon Cemetery. For many years Magdaleno managed the store at Castolon, first for Wayne Cartledge and later for the national park concessionaire. He and Maria had five children. (1). Son Jesus Garcia married Grace Rojas. (2). Son Raul Garcia married Florence Fierro. In February 1999 they were living in Houston. (3). Daughter Baudelia Garcia married Orlando Leyva. In February 1999 they were living in Alpine. (4). Son Jose Garcia was living in Marathon in February 1999. (5). Son Gabriel Garcia was living in Houston in February 1999. (1). Daughter Cleotilde Pinedo married Frank Acosta. (2). Son Ruben Pinedo was born June 3, 1953. His wife’s name is Carmen. (1). Son Eliseo Garcia was born September 30, 1946 in Brewster County. In July 1999 he was living in Odessa, Texas. He married Bertha Steinbeck. (2). Daughter Susana Garcia was born May 24, 1948 in Brewster County. In July 1999 she was living in Fort Stockton. She married Eleno Sanchez. (3). Daughter Carolina “Carol” Garcia was born November 2, 1949 in Brewster County. In July 1999 she was living in Odessa, Texas. She married Rex Uranga. (4). Daughter Escolastica Garcia was born February 10, 1952 in Brewster County. In July 1999 she was living in Marathon, Texas. She married Domingo Hernandez, Jr. He was born in Brewster County September 17, 1951, the son Domingo Hernandez, Sr. and Dorotea Victorino, and the grandson of Guadalupe Hernandez and Teresa Baeza. (5). Daughter Rita Garcia was born June 27, 1953 in Brewster County. In July 1999 she was living in Houston, Texas. She married Roberto Marquez. (6). Son Tiburcio Garcia, Jr. was born January 1, 1955 in Brewster County. In July 1999 he was living in Alpine. He married JoAnn Rivera. (7). Son Jose “Joe” Garcia was born February 26, 1957 in Brewster County. He married Elva Ramos. (8). Daughter Bernarda Garcia was born July 17, 1960 in Brewster County. In July 1999 she was living in Odessa. (9). Son Pablo “Paul” Garcia was born March 18, 1962 in Brewster County. In July 1999 he was living in Alpine. (10). Son Juan Angel “Johnny” Garcia was born July 4, 1964 in Brewster County. In July 1999 he was living in Alpine. (11). Son Peter Garcia was born February 11, 1968 in Brewster County. (1). Daughter Sylvia Garcia was born September 8, 1949 in Brewster County. She married Joe Cobos. (2). Daughter Irene Celestina Garcia was born May 19, 1954 in Brewster County. She married George Primera. (3). Son Larry Garcia married Helen JoAnn Bell. (4). Son Walberto Garcia was born January 24, 1964 in Brewster County. (5) Daughter Loretta Garcia was born September 30, 1966 in Brewster County. F. Son Liborio Garcia was born July 1, 1928 in Marathon. (2). Son Robert Garcia. His wife’s name was Tana. 5. Daughter Fabiana Garcia was born in Fort Davis January 20, 1892 and was baptized there January 23, 1892. Her godmother was Florentina Castro. She was still living with her parents in Terlingua in 1920. She died in Hotel Dieu Hospital, El Paso September 16, 1958 of bladder cancer and is buried in Alpine. A. Manuel Garcia was born October 18, 1918 and died February 7, 1980. He is buried in Carlsbad, New Mexico. His wife’s name was Edna Marie. A. Daughter Pamfila Garcia married Elias Gonzales. They had nine children. (6). Son Elias Gonzales, Jr.
(1). Son George Griego was born in 1950 and died the same year. (2). Son Rudy Griego. His first wife’s name was Margie and his second wife was Conchita Dominguez. (3). Daughter Gloria Jean Griego. Her married name is Mendoza. (4). Daughter Gracie Griego married Louie Najar. (5). Daughter Patsy Griego married Bonnie Ybarra. (1). Son Porfirio Martinez, Jr. His wife’s name is Grace. (3). Daughter Priscilla Martinez. Her married name is Franco. (2). Son Robert Garcia was born March 4, 1955 and died April 17, 2005. His wife’s name was Irma. 7. Son Santiago Garcia was born July 25, 1897 in Fort Davis. He died at his home in Huron, California September 9, 1993. He moved with his parents to Marathon, then to Terlingua. From 1920 until at least 1937 he worked for the Chisos Mining Co. as a miner and pumper. In July 1934, while working for Chisos Mining Co., he was injured while working on a 4 inch pipe line between #39 and #9 shafts. He dropped a pipe on his little finger, cutting it badly, but the bone was not broken. He was able to continue working. His Chisos employee number was 754. On October 14, 1921 Santiago married Rosario Mata. She was born in Terlingua de Abajo November 6, 1904, the daughter of Guadalupe Mata and Merced Herrera. She was baptized in Terlingua February 6, 1905 by Father Brocardus. Her godparents were her grandparents, Gregorio Mata and Guadalupe Ortega. She died in Huron, California March 22, 1985. Santiago and Rosario had ten children. (4). Daughter Angelina Reschman. She married John McLean. After her marriage she was known as Violeta. In 2010 they were living on Section 254 of Block G-4, known as the Garcia Section, between Study Butte and Terlingua. (5). Daughter Estela Reschman married Larry Austin. (2). Daughter Mary Elizabeth Garcia. (1). Son Santos Garcia, Jr.
C. Daughter Refugia Garcia was born July 4, 1926 in Terlingua and died there September 4, 1930. Prior to her death she was treated by Chisos Mining Co. physician Dr. C.O. Hurley. She is buried in the Terlingua Cemetery. D. Daughter Margarita Garcia was born April 28, 1928 in Terlingua. She married Ignacio Urueta and they had five children. (1). Daughter Sylvia Urueta was born in 1946. She married Jasso Perez. (2). Daughter Olga Margarita Urueta was born in 1958 and died in 1953. (3). Daughter Bertha Urueta, born in 1955, married Kerry Lobo. (4). 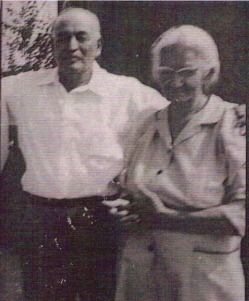 Daughter Dolores Urueta married Eduardo Juan Martinez. (5). Daughter Esperanza Urueta, born in 1959. (1). Son Bonifacio Garcia, Jr.
(2). Son Santiago “Jim” Garcia. (5). Son Jorge “Jeff” Garcia. (3). Son Ignacio Garcia, Jr.
(1). Son Richard Aguilar, Jr. married Hortencia Ibanez. (2). 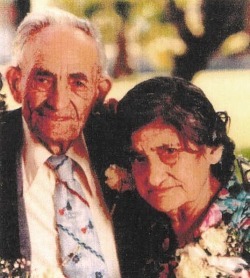 Son Joseph Aguilar married Gloria Garcia. (3). Son Eddie Aguilar. His wife’s name is Stehanie. (1). Son Antonio “Tony” Garcia, Jr.
(4) Son Louis Garcia married Reina Hernandez. I. Daughter Rosa Garcia was born September 5, 1939 in Brewster County. She died in 1995. 8. Daughter Demetria Garcia was born in Texas December 22, 1899. She was baptized in Marathon February 15, 1900 by Father Brocardus. She died in 1906. A. 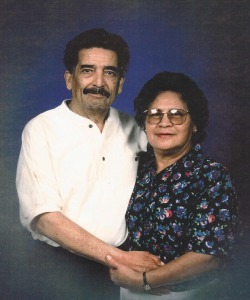 Daughter Esperanza Loya was born in 1929 and died December 25, 2009. B. Daughter Rosa Loya was born August 30, 1932 in Brewster County. In January 1993 she was living in Fort Stockton. (1). Son Martin Villareal, Jr.
(4). Daughter Maria Villareal. Her married name is Trevizo. 10. Daughter Sabina Garcia was born in 1902 in Terlingua. She was living in the Terlingua area with her parents in 1920. She died in Big Bend Regional Medical Center, Alpine December 10, 2001 and is buried in Holy Angels Cemetery. 11. Daughter Josefa Garcia was born March 23, 1905 in Terlingua. She was baptized September 11, 1905 by Father Brocardus. Her godparents were Antonio Enrique and Antonia Macias. She died in a hospital in Odessa August 30, 1997 and is buried in Holy Angels Cemetery, Alpine. (a). As the mining operations reached greater depths, they frequently encountered water. Santiago apparently was one of the employees whose job was to pump water from the mine.